Multiple sclerosis (MS) as the most common autoimmune disorder in the central nervous system is a major health problem. MS is a complex disease with multiple environmental and genetic factors participating in it. In the present study, we evaluated the expression of 3 genes named BCL2, CASP2 and CASP8 in peripheral blood of 50 MS patients and 50 healthy controls to investigate the role of apoptosis, necroptosis and DNA damage signaling pathways in MS. Statistical analysis showed a significant increase in BCL2 and CASP2 expressions while a significant decrease in CASP8 expression in patients compared with the control group. The over-expression of the pro-apoptotic BCL2 is anticipated to induce accumulation of auto-reactive T cells which are involved in MS pathogenesis. Since caspase 8 is vital for the suppression of necroptotic pathway, defective activation of caspase 8 can cause inflammation and may be involved in the pathogenesis of MS disease. In brief, we have demonstrated altered levels of BCL2, CASP2 and CASP8 in MS patients compared with healthy subjects which potentiates these genes as biomarkers or therapeutic targets in MS. Further researchers are needed to evaluate the clinical relevance of these markers. Multiple sclerosis (MS) is the most common autoimmune disorder in the central nervous system which can lead to severe disability in young adults. The most common form of MS is the relapsing-remitting MS (RRMS) which affects 85% of the patients. RRMS is associated with periods of remission in which symptoms of the disease disappear. MS is a complex disease, indicating that it has multiple causes including environmental and genetic factors. Among the factors which seem to play a role in MS, genetic factors have pivotal role (Goldenberg, 2012, Mazdeh et al., 2017; Eftekharian et al., 2017). MS has been proven as a demyelinating disease, in which the immune system attacks myelin sheath surrounding nerve cells leading to the neurodegeneration. Notably, in this disorder, autoreactive T cells and B-cells attack and destroy myelin sheath causing neuroinflammation and neurodegeneration (Lucchinetti et al., 2000). One of the important causes involved in the pathogenesis of MS is the T cell ability to escape apoptosis (Pender, 1998). The inability of the immune system to remove self-reactive lymphocytes is due to a defect in cell death machinery which ultimately results in autoimmune reactions. Based on a study which has been conducted in RRMS patients by cDNA microarrays, more than 80% of the top 30 most significant altered genes have been shown to be associated with apoptosis signaling pathway (Satoh et al., 2005). Among the genes involved in apoptosis, the BCL2 family and caspases are very important (Ola et al., 2011). BCL2 gene is an anti-apoptotic gene whose over-expression in T cells leads to abnormal reactions including auto-reactive reactions (Bouillet et al., 1999). Caspases are cysteine-aspartic proteases that play a significant role in apoptosis and are classified into two categories: initiator caspases (caspases 8 and 9) and effector caspases (caspase 3,6 and 7) (McIlwain et al., 2013). In addition to the apoptosis pathway, each caspase enzyme also has other functions. For example, caspase 2 is also implicated in DNA damage signaling (Zhivotovsky and Orrenius, 2005), and recent data indicated that caspase 2 activation could occur following the formation of DNA double strand breaks (DSBs). Caspase 2 has also been shown to be induced by reactive oxygen species (ROS) and endoplasmic reticulum (ER) stress. Active caspase 2 is then thought to be involved in G2/M cell cycle arrest and DNA repair by non-homologous end joining (NHEJ) (Figure 1). It is not known how caspase 2 mediates these functions (Kumar, 2009). 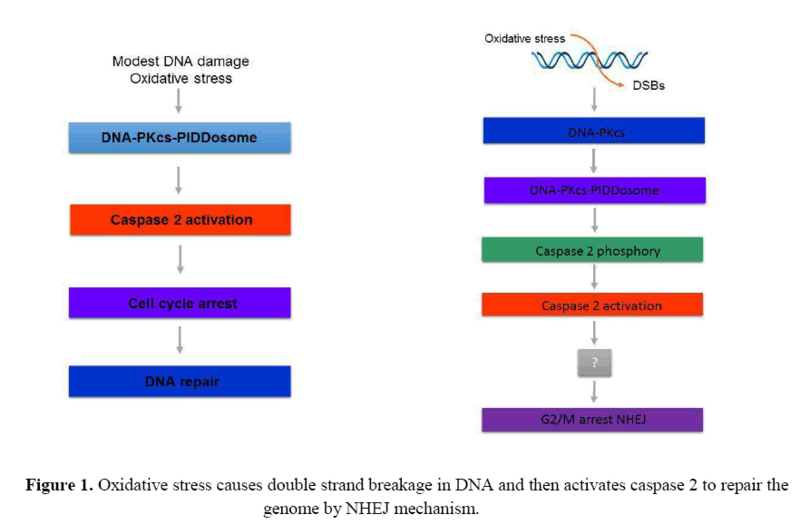 Figure 1: Oxidative stress causes double strand breakage in DNA and then activates caspase 2 to repair the genome by NHEJ mechanism. Several lines of investigations show that markers of oxidative stress have increased in serum or plasma of MS patients. For example, decreased ferroxidase activity and lower antioxidant capacity have been shown in multiple studies (Karlík et al., 2015, Ohl et al., 2016, Wang et al., 2014). At the cellular level, ROS production increased by macrophages and lymphocytes in MS patients compared to the control group (Van Horssen et al., 2008). Caspase 8, as an initiator caspase which is involved in extrinsic apoptotic pathway is a pro-apoptotic protein (Boatright and Salvesen, 2003) and reduction of this protein leads to enhance the susceptibility of activated lymphocytes to expand (Achiron et al., 2007) and induce acute relapses with persistent inflammation in patients with RRMS. In addition to important pathways like apoptosis and response to DNA damage which have important functions in the pathogenesis of the MS, the role of necroptosis in this autoimmune disease has also been proven (Ofengeim et al., 2015). Necroptosis is a regulated form of necrosis, which results in the release of intra cellular contents, leading to start of innate immune response and finally inflammation. It has been reported that caspase 8 is also active in this pathway. Of note, in the absence of an effective apoptotic signaling, the process of necroptosis begins by interaction of Receptor Interacting Serine/Threonine Kinase 1 (RIPK1) and RIPK3, which leads to phosphorylation of RIPK3 and formation of a complex called IIb, which is essential for induction of necroptosis. Subsequently, activated RIPK3 phosphorylates mitogen-activated protein kinase MAP3K9 (MLK1) and triggers its oligomerization and its entry into the plasma membrane and finally leads to the initiation of necrosis. Caspase 8 is necessary to inhibit the activation of necroptosis and thus decreased or no expression level of this protein may lead to the initiation of necroptotic pathway and finally rendering inflammatory responses (Figure 2) (Newton and Manning, 2016). Figure 2: Caspase 8 role in different inflammatory pathways. In the present study, the expression of 3 genes named BCL2, CASP2 and CASP8 were analyzed in peripheral blood of 50 RRMS patients and 50 healthy controls to investigate the role of apoptosis, necroptosis and DNA damage signaling pathways in MS and to understand the functions of the mentioned genes in the pathogenesis of this disease. This study is an association study (case-control) that was performed on 50 patients with RRMS and 50 healthy matched controls. Patients participating in this study were clinically diagnosed with McDonald's criteria (Polman et al., 2011) by an experienced neurologist. The inclusion criteria were RRMS type, response to Interferon β treatment and availability of clinical data. There were no exclusion criteria for patients who met the inclusion criteria. All patients were clinically in the stable phase. All of them were under treatment with Cinnovex TM (Mazdeh et al., 2016; Taheri et al., 2017). Moreover, Vitamin D level was checked for both patients and control subjects and if they were normal, they were included in the study. The clinical diagnosis was approved by the Magnetic Resonance Imaging (MRI) criteria. All of the participants signed the informed consent, and the study was conducted on the basis of the approval by the local ethics committee of Shahid Beheshti University of Medical Sciences (IR.SBMU.MSP.REC.1396.635). The study protocol was in line with the Declaration of Helsinki. In this study, 3 ml of peripheral blood was collected in the EDTA tube. Total RNA was extracted using Gene All Hybrid-RTM blood RNA extraction kit (cat no.305-101). The quality and quantity of RNA was assessed using NanoDrop 2000 spectrophotometer (Thermo Fisher) and gel electrophoresis. Applied Biosystems High-capacity cDNA reverse transcription kit (PN:4375575) was used for cDNA synthesis and the manufacturer's instructions were executed. Synthetized cDNAs were kept at -20°C until expression analysis. Allele ID7 (Premier Biosoft, Palo Alto, USA) software was used to design specific probes and primers of each gene. HPRT1 gene was selected as the normalizer. The sequences of designed probes and primers and the length of the PCR products are listed in Table 1. Real-time quantitative PCR was carried out in duplicates by using Applied Biosystems TaqMan Universal PCR Master Mix (PN: 4304449). Corbett Rotor gene 6000 machine (Corbett Life Science) was used to run the reactions. The negative control was included in each run for quality control and also detection of contamination. PCR conditions were as follow: a primary activation step for 5 minutes at 95º C followed by 40 cycles at 95 ºC for 15 seconds and 65 ºC for 1 minute. The total reaction contained 3 μl of cDNA, 4.5 μl nuclease free water, 10 μl of Master Mix 2×, 250 nM of the probe, and 900 Nm concentration of each primer. Table 1: The sequences of designed probes and primers and the length of the PCR products. To test the significance of difference in means between two group’s Kruschke's Bayesian estimation was implemented to fit two-sample Bayesian t-test. A normal prior distribution was assumed for parameters with 200000 iterations. The power analysis based on 2000 simulated replications was used to check the power and precision of estimation. The interpretation of Bayesian results is based on 95% Highest Density Intervals (95% HDI). The P-values were computed from frequentist methods (traditional two independent T test or Mann-Whitney U test). Spearman correlation coefficient was applied for assessment of correlations between the level of genes expression and clinical or demographic variables. The level of significance was fixed at< 0.05. The analysis was implemented in the free programming languages R 3.5.1 using BEST package. The study was performed in 50 patients with RRMS (6 males and 44 females) and 50 healthy controls (11 males and 39 females). The demographic and clinical data of participants including age, disease duration and Kurtzke Expanded Disability Status Scale (EDSS) of patients as well as the mean age of control group are listed in Table 2. Table 2: Demographic and clinical data of study participants (EDSS: Expanded Disability Status Scale). Statistical analysis showed a significant increase in BCL2 and CASP2 expressions while a significant decrease in CASP8 expression in patients compared with the control group. The expression of BCL2 in patients was about 2-fold higher than the control group (P value=0.002). The expression of CASP2 in patients was about 11.5-fold higher than the control group (P value<0.001). The expression of CASP8 gene in the patient group was approximately 0.4 of the control group (P value=0.0008). The relative expressions of BCL2, CASP2 and CASP8 genes in MS patients compared with healthy subjects are demonstrated in Tables 3-5. The expression levels of BCL2 and CASP2 were significantly increased in female patients compared to the control women. Furthermore, the level of expression of CASP8 gene in both male and female patients was significantly reduced compared with the healthy subjects of the same gender. Table 3: Comparison of the expression of BCL2 gene between patients and the control group in different subgroups based on age and gender. Table 4: Comparison of the expression of CASP2 gene between patients and the control group in different subgroups based on age and gender. Table 5: Comparison of the expression of CASP8 gene between patients and the control group in different subgroups based on age and gender. We also assessed relative expression of mentioned genes in age-based subgroups. A significant change in the expression of BCL2 gene was observed in women over 40 years old compared to healthy women over 40 years of age. In addition, a significant change in the expression of CASP2 gene was observed in women under the age of 30 years, as well as in women over 40 years of age compared with age-matched healthy women. A significant reduction in the expression of CASP8 gene was observed in men between 30-40 years of age compared to healthy age-matched men. The levels of expression of BCL2, CASP2 and CASP8 genes and their relevance to the EDSS were studied in 50 RRMS patients. There was no significant correlation between the expression level of these gene and EDSS. There was a significant inverse correlation between CASP8 mRNA level and age at onset (Figure 3). However, such analyses revealed no correlation between expression of other genes and age at onset. 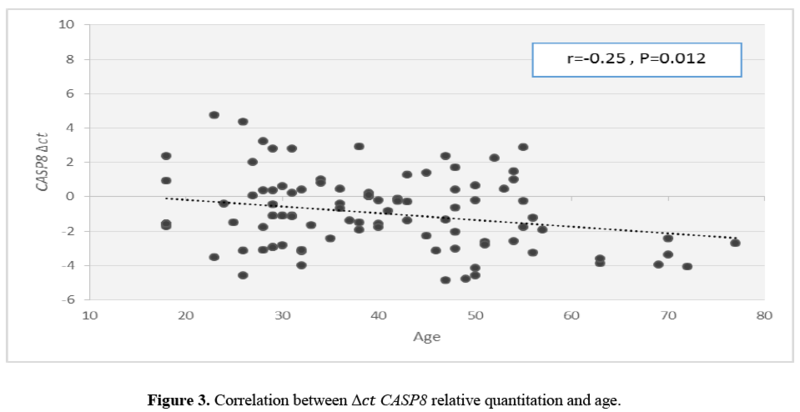 Figure 3: Correlation between Δ���� CASP8 relative quantitation and age. There was a significant correlation between BCL2 and CASP2 transcript levels (Figure 4). 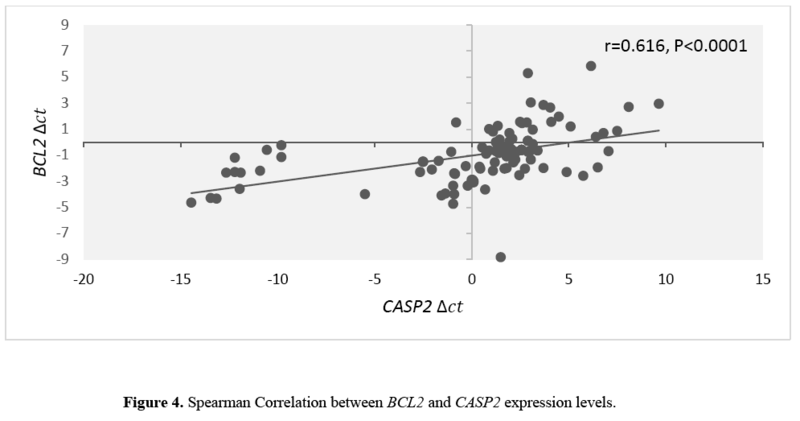 Figure 4: Spearman Correlation between BCL2 and CASP2 expression levels. BCL2 has strong anti-apoptotic activity in a variety of cells including lymphocytes (Sharief et al., 2003). Interestingly, our results showed a significant increase in BCL2 expression in patients when compared with the control group. It is noteworthy to mention that the over-expression of BCL2 protein can lead to the systemic autoimmune disorders through the accumulation of active T cells (Zipp, 2000). Histopathologic studies have shown an increase in BCL2 expression in the lymphocytes in the MS plaques (Zettl et al., 1998). However, some studies have not showed any significant increase in the expression of BCL2 in peripheral or intrathecal lymphocytes in MS patients (Zettl et al., 1998; Sharief, 2000; Semra et al., 2001). Most studies suggest that abnormal expression of BCL2 in MS patients leads to resistance to apoptosis in T-lymphocytes and can further lead to cell division and tissue degradation. Moreover, the increased expression of this protein in inflammatory sites has been reported in some diseases. In patients with Behcet, a significant proportion of T cells had an increased expression of BCL2, both in peripheral blood and in inflammatory sites (Hamzaoui et al., 1999). In vitro incubation of T lymphocytes with interleukin (IL)-10 and IL-2 resulted in a significant increase in BCL2 expression (Deng and Podack, 1993; Cohen et al., 1997). Considering the observed up-regulation of IL-2 and IL-10 in MS patients, one of the underlying causes of increased expression of this gene in our study may be the increased levels of mentioned cytokines in MS patients. In patients with Behcet, the stimulation of T cells with some viruses such as herpes simplex virus 1 (HSV-1) can lead to increased expression of BCL2 (Hamzaoui et al., 1999). The association between infection with some pathogens such as herpes virus 6 and endogenous retroviruses and MS has been observed in some studies (Oskari Virtanen and Jacobson, 2012). So the observed over-expression of BCL2 in this study may be due to the possible presence of mentioned pathogens. According to our data, the expression levels of CASP2 were remarkably increased in patients group compared to the controls. Although CASP2 gene is known to be one of the pro-apoptotic genes, some studies pointed out that CASP2 is not essential for apoptosis (Kumar, 2009), and some cells, such as thymocytes and neuronal cells do not require this gene for apoptosis (O'Reilly et al., 2002). Other cells use this gene as a compensatory pathway for apoptosis. It has been shown that caspase 2 is involved in DNA damage signaling and active caspase 2 has important role in DNA repair mechanisms (Kumar, 2009; Zhivotovsky and Orrenius, 2005). Of note, small and repairable damage in DNA structure leads to activate caspase 2 (Kumar, 2009). One of the reasons that caused the double-stranded breakage in DNA is the reactive oxygen species (ROS) levels or oxidative stress (Barzilai and Yamamoto, 2004). Levels of oxidative stress parameters have been significantly higher in MS patients compared with control group (Ohl et al., 2016; Wang et al., 2014). Since ROS are able to make double-stranded breakages in DNA (Barzilai and Yamamoto, 2004), we hypothesized that the increased expression of CASP2 in patients group may be due to the higher levels of oxidative stress in RRMS patients compared to the control groups. In the present study, we also showed a considerable decreased expression of CASP8 mRNA in patients compared with healthy controls. Since caspase 8 is vital for the suppression of necroptotic pathway, defective activation of caspase 8 can be involved in the pathogenesis of MS disease. Defective activation of caspase 8 can cause inflammation through necroptotic machinery. In the process of necroticosis, receptor-interacting serine/threonine-protein kinase 1 (RIPK1) interacts with RIPK3, leading to RIPK3 phosphorylation of and IIb complex construction. Once RIPK3 is activated, it causes phosphorylation of myosin light chain kinase 1 (MLK1) which leads to the start of the necroptosis process (Newton and Manning, 2016). As observed previously, RIPK1 and RIPK3 protein levels in the post mortem samples of MS patients were increased, which indicates a correlation between the increased necroptosis and development of MS cortical lesions (Ofengeim et al., 2015). The lack of caspase 8 in the cells causes chronic inflammation, the mechanism which is suggested for initiation of inflammatory process mediated by RIPK1 and RIPK3. Genetic studies in mice have shown that caspase 8 can restrict necroptosis in some types of cells such as endothelial cells, keratinocytes and intestinal epithelial cells (Zhang et al., 2011; Oberst et al., 2011; Kaiser et al., 2011; Welz et al., 2011; Bonnet et al., 2011; Kang et al., 2012; Weinlich et al., 2013). These studies suggest that along with induction of apoptosis and cell death, caspase 8 leads to a reduction in some of the inflammatory mechanisms. On examining the impact of caspase-8 deficiency on the functions of various signaling pathways that control inflammation, researchers demonstrated that in numerous kinds of cells, caspase-8 reduction leads to activation of the transcription factor interferon regulatory factor 3 (IRF3) by unknown intracellular DNA or RNA molecules. The retinoic acid-inducible gene I (RIG-I) signaling complex has been found to participate in the activation of IRF3. In addition to IRF3, this signaling complex contributes in the activation of numerous transcription factors following exposure to foreign DNA or RNA molecules. When components of this complex are gathered together, caspase 8 is engaged in it and inhibits its function. Hence, cells lacking caspase 8 display too much activation of this complex which would trigger inflammation (Wallach et al., 2010). The presence of some viruses, such as endogenous retroviruses and herpes viruses has been reported in patients with MS (Oskari Virtanen and Jacobson, 2012). Therefore, the presence of these viruses can lead to the formation of a RIG-1 complex and the release of IRF3. Decreased expression of caspase 8 as revealed in our study may prevent suppression of the mentioned complex and eventually lead to inflammation. In brief, we have demonstrated altered levels of BCL2, CASP2 and CASP8 in MS patients compared with healthy subjects which potentiates these genes as biomarkers or therapeutic targets in MS. Further researchers are needed to evaluate the clinical relevance of these markers. Our study has both strengths and limitations. We assessed expression of a number of apoptosis-related genes in peripheral blood of MS patients which is an accessible source of biomarker discovery. We also evaluated associations between transcript levels of these genes and clinical data of patients which might imply their relevance with disease course. The main limitations of our study are relative small sample size and lack of protein data. Assessment of expression of these genes at protein level would explore the underlying mechanism of dysregulation of the mentioned signaling pathways in the context of MS disease. So we recommend future studies to confirm our results at protein level. The current study was supported by a grant (grant number:12695) from Shahid Beheshti University of Medical Sciences. Romina Dastmalchi conducted the experiments. Arezou Sayad and Mir Davood Omrani designed and supervised the study. Soudeh Ghafouri-Fard contributed in data analysis and manuscript review. Shahram Arsang-Jang analyzed the data. Mehrdokht Mazdeh assessed patients and confirmed the diagnosis. Mohammad Taheri contributed in study design and technical support.